Google Voice now has global spam filtering!!! I’ve been putting my google voice number out there to clients for sometime via my email signature. It is by far the best way to reach me. I actively route it to wherever I am. However, I haven’t publicized via online listings, ads, literature and business cards, because I don’t want it bombarded with phone SPAM. My verizon numbers, that I’ve been using for 15 years, sometimes get as many as 10 unsolicited calls per day in spite of me telling everyone to take me off their calling list and being on the national do not call list. This is exactly what I needed to start pushing our google voice number in everything and all mediums. Why can’t verizon evolve more rapidly and put customers first? 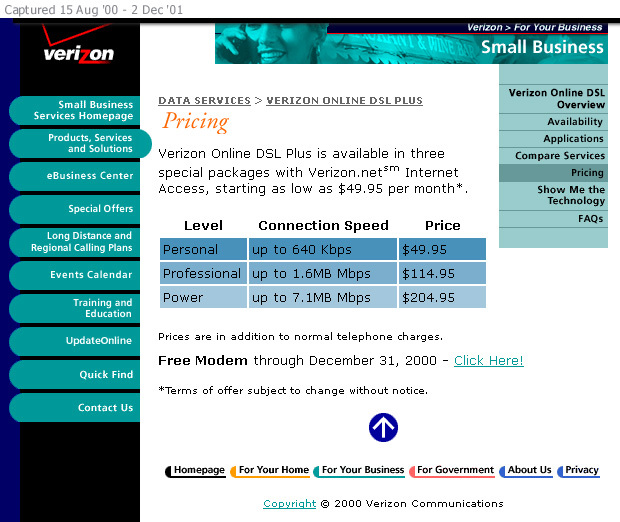 You know they used to charge $49 to 200 for DSL 10 0r 12 years ago (historical ADSL pricing screenshot below). My SDSL was $199 for years then I got it for $99 through a subcontracted reseller. At the time, I couldn’t get the $99 “deal” by buying it through Verizon. They sat on their hands and watched nearly every one of their home customers go to comcast for just $29 per month, because they wouldn’t lower their price. Their historic behavior is the whole reason I haven’t switched to FiOS. So in conclusion, “Yeah Google!! !” and “Verizon Hurry Up”. You need to change faster because the world will move on without you… just like they did when you were providing DSL for more than the competition!